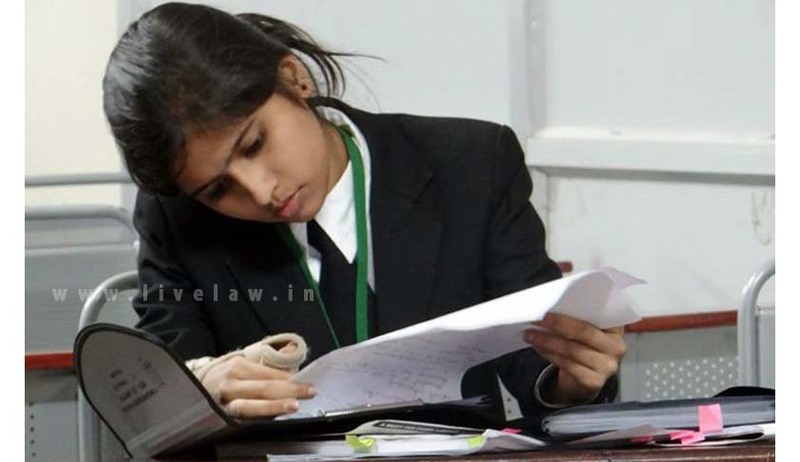 XIX All India Moot Court Competition 2015 – ULC Bangalore. This is one of the most prestigious mooting competitions in India. CRM Law School, Bangalore won the moot and National Law University, Odisha was placed second. The bench for the final rounds of the competition was presided over Justice K L Manjunath, Justice Ram Mohan Reddy, Judges, High Court of Karnataka and Justice Huluvadi G. Ramesh, Judge, High Court of Allahabad and the other eminent jurists and academicians. Smriti Singh from NLUO was adjudged the BEST SPEAKER. The award for the BEST RESEARCHER went to Shubhangi Jain. Faculty of Law, Allahabad University was awarded for the BEST MEMORIAL. Congratulations for your achievement Smriti Singh !!! Live Law : How do you feel after winning the best speaker award? How many days of hard work you did to accomplish this position? Smriti : The award of the best speaker came as a surprise for me and it felt great when I got it. We had worked for this moot for 2 months and after we were adjudged the runners-up this award was a bonus for me and my team. Live Law : What difference did you find in XIX All India Moot Competition 2015 as compare to other National Moot competition? Smriti : The quality of judges was really very good from the prelims to the finals. They were aware of every minute detail of the facts as well as the law. The standards of judging were very high which I think was the best part of this moot. Smriti : While giving my orals, specially the quarter-finals the questions that were put before us taught me that when we are preparing for any kind of moot or even presentations we need to be aware of every minute detail. For eg. Where is the term black money defined? This does not come to mind while we prepare the memorial but as a law student we need to know the legal definition of every word that we use. Smriti : The hardest part of any moot, in my opinion is maintaining the emotional and mental balance. When there is a lot of work load we tend to lose our cool and get irritated but it is just the beginning. Handling the pressure of the submission, orals and results was the toughest part. Smriti : No, My team-members supported me a lot and therefore, it was easy to cope with any problem that I faced during the moot. Infact, I enjoyed a lot while preparing and mooting. Smriti : When we took this moot we were clear about one thing that we will do our best and will not worry about the results. So, we just thought of it as a learning experience which I think helped a lot to remove that unnecessary pressure from me. Live Law : After the winning as the Best Speaker would be you like to change the pattern of your preparation? Smriti : It is not really after winning the Best Speaker that I would like to introduce changes in my pattern of preparation but I think every moot teaches some new lessons which need to be incorporated in the future. While practicing for orals it is necessary that the team should have brain storming question answer session which helps a lot in top rounds. Smriti : I would like to give full credits to my college and professors who gave me a lot of support. I would like to thank Mr. Yogesh Pratap Singh and Prof. Uday Raj who took out their precious time to guide us. I would also thank my seniors and classmates who gave me every possible help. Smriti : I was the runner-up in the 1st Damodarram Sanjjivnyya National Moot Court Competition. My team also won the citation for the Best Memorial in the same moot. Live Law : What area of law would you would like to expertise? Have this moot change your mind set of in the area you would like to expertise? Smriti : I have an inclination towards Constitutional Law and fortunately the moot was also on the same area with a bit of tax laws involved. However, I haven’t decided on the area I would like to expertise in future. Smriti : My team decided to intern in the same city so that we could meet for preparation. We used to give a fixed time everyday for the moot and manage the other activities in the remaining time. Moreover, we had divided our area of work which made the preparation easier. Smriti : My ultimate goal is to become a teacher. But, the path which I will take to achieve this is not yet decided. I may take up litigation or work in corporate sector to gain practical knowledge which will help my future students !!! Smriti : I was lucky that my team-members were my friends so it was a great experience working with them. Whatever problems I faced, my team-members helped me to solve them. So there was no such road-block in the preparation. Smriti : There were 57 teams out of which 28 teams were selected on the basis of the memorial. In my opinion NLIU Bhopal was our toughest competition. Smriti : I would just say that whatever you do, try to give your best and every activity should be a learning experience. One should actively participate in extra-curricular activities as self-learning is the best way to gain knowledge.